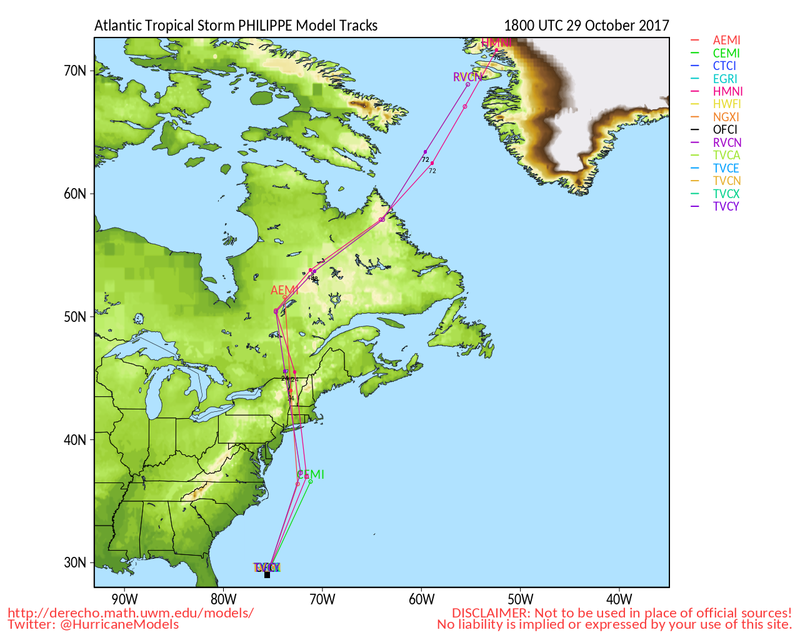 While likely undergoing or having completed extratropical transition, Ophelia is now expected to enter Ireland at hurricane intensity, with an ever-expanding wind field. 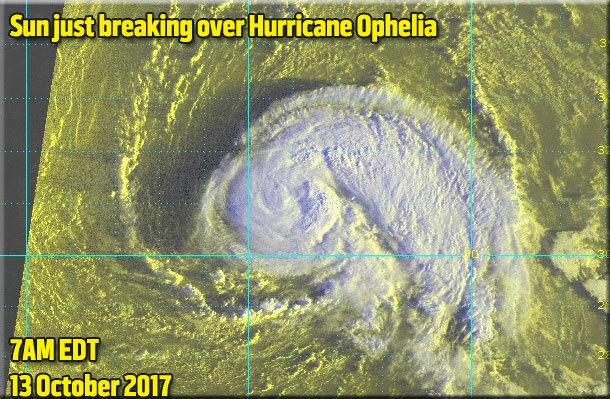 Ophelia is moving the east northeast currently as a category 2 hurricane and should move just east o the Azores, after this it may be near or over Ireland as an extra tropical storm (similar to what Sandy was right at landfall in New Jersey) If the forecast holds as is, it's possible for storm surge and strong winds to show up along the western coast of Ireland.on Monday, and later Scotland on Tuesday. It wouldn't be a tropical system at that time, but it still would have a lot of the energy. There is still a great deal of uncertainty at that range of the forecast. 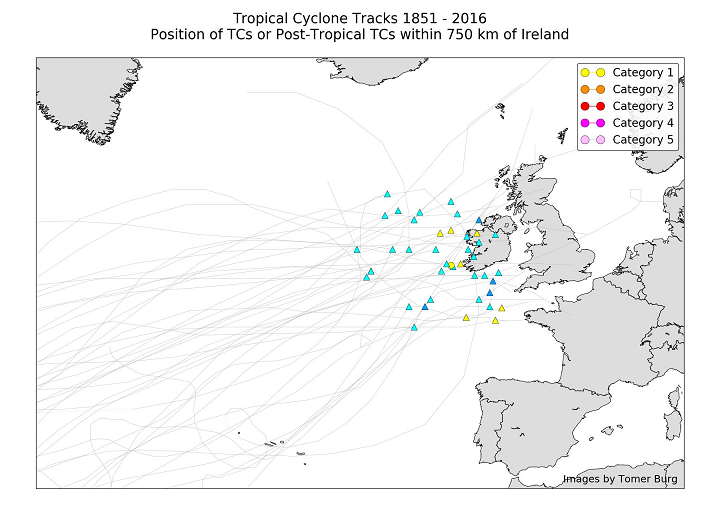 There have been other tropical systems that have gone on to Ireland or the UK before, including Debbie in 1961, but they are extremely rare. Katia in 2011 was another example. Additionally there is a system east of the lesser Antilles with a 20% chance for development over the next 4 days, this area would likely curve north away fromt he islands, but Bermuda may still need to watch it. 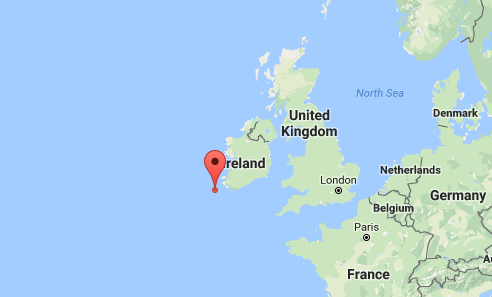 Tropical Storm Ophelia is active in the far east Atlantic, and expected to remain there well away from any land areas. It is forecast to become ahurricane, but only affect shipping. Elsewhere in the Atlantic there is not immediately threats of development, and nothing obvious in the mid range either. The areas to typically watch are the Gulf, West Atlantic and especially the Western Caribbean (where Nate came from), but none of these areas currently have anything going on. Things tend to change fairly quick in October, though, so it's worth keeping up with every few days. 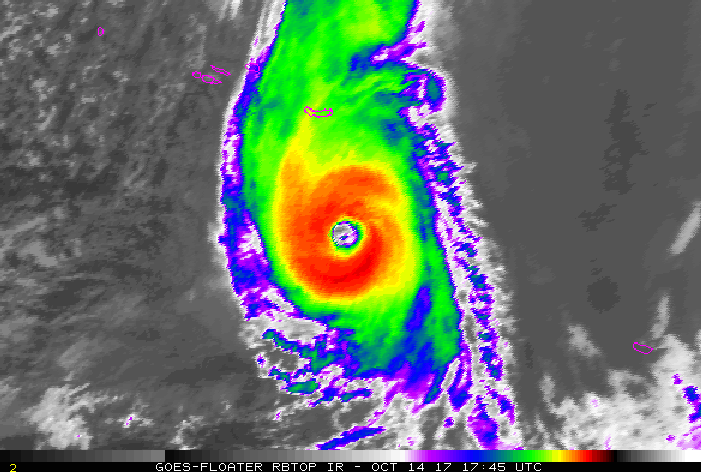 The season starts to wind down around the last week of October, so with a little luck Nate may be the last landfall we'll deal with this year. But, there still remains a good amount of energy left, so there's still a very good chance that something else could form before the season is done. 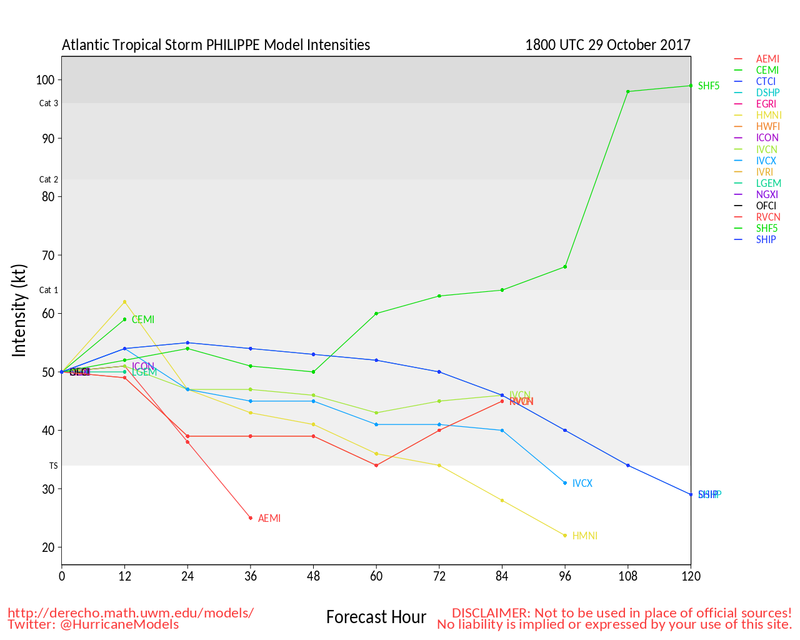 Several of the most recent reliable satellite derived intensity and wind estimates suggest that Ophelia may be heading to, if not already at, Cat 4. Would love it if someday we can gather recon data from way out in the Atlantic - even remote controlled flights would be incredibly informative. This is indeed what confirmed Cat 4s often look like. We're feeling the effect of Ophelia in Birmingham, England - no wind yet but really unseasonably high temperatures - around 10 degrees Celsius (18 degs F) higher than normal for October. The Saharan sand has made it to Hamburg by today. Very similar looks of the sun and sky here in Germany today. Development chances are up to 40% in the western Caribbean according to the NHC for the next 5 days. Slow development is possible as a broad area of low pressure slowly develops and moves W/NW. 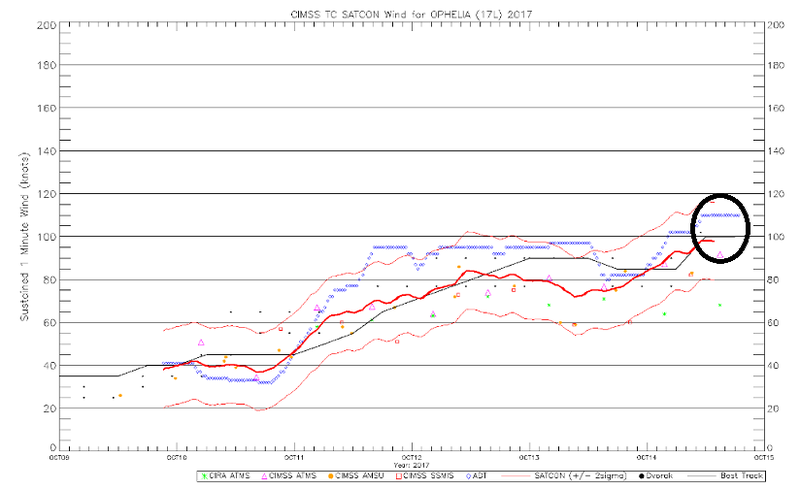 The Great frontal wall has set up for the year (pushing through Florida right now). It's highly unlikely there will be any more CONUS landfall this year.